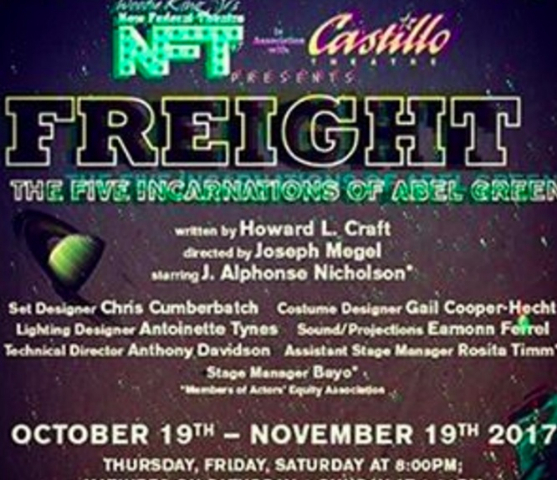 Howard L. Craft has crafted a superb play in Freight: The Five Incarnations of Abel Green. What was it like to be a young black man in America throughout the 20th century and on into our own? Minstrel, preacher, panther, sub-prime mortgage salesman, Abel Green has tried them all. J. Alphonse Nicholson makes his efforts palpably moving. This is a one man show and he is miraculously convincing as many figures. The audience suspends disbelief without a moment's pause. Once the black man was free, free at last, he sought role models. Craft has created five unforgettable portraits of a young, green and able man who selects mentors to guide and is ultimately disappointed by them. 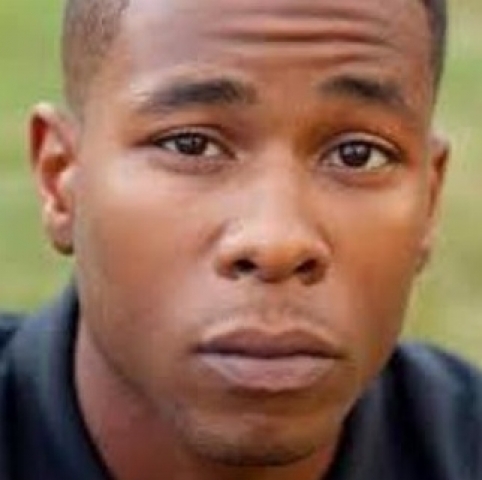 William Benson is the name of the role model. On first look Green is magnetically attracted to him. As Green matures, he sees warts and all. While this disappoints, he soldiers on. The more sinister third party, Alphonse, hovers to subvert and corrupt. Benson, the imagined model figure, is a minstrel when we are first introduced. At the turn of the century, he has come up with the clever notion that if entertainers in black face are popular, why not show the real thing? This works, until Benson and Green find themselves in Jefferson, the ubiquitous place of racial confrontation. Green and Benson look up at a hanged black body whose ears and nose has been removed along with his private parts. Fearful of the same fate, Benson quits performing. Green dons a new outfit and keeps on trucking, or jumping onto trains. On the train which journeys through the production, with forceful sets by Chris Cumberbatch, Green takes on a pullman porter's uniform and shows us a highlight of black male experience. Benson's next modeling is as pastor, but he dies, and Green becomes the substitute instrument of God. He is made to believe he can heal by con man Alphonse, who reappears as a seducer and liar in Green's future. Reincarnated as an FBI agent on surveillance duty with the Black Panthers, Benson solicits Green's help. Green comes to like the Panthers and love one of them, Mary. When they are threatened by a raid, Green confides again in Alphonse, who betrays him by burning down Panther headquarters with Mary inside. Benson gets his, which does not seem entirely deserved, when he contracts AIDs from a lover. Green is standup here, and comforts his mentor as he dies. As though the deaths of Mary and Benson were not enough to bear, and perhaps to overcome an effort to be good, Green becomes a sub prime mortgage salesman, selling his people dreams which go up in flames as their homes are repossessed. Redemption might have been more satisfying if Green had returned to his music. In a surprising way, he does, displaying his concert skills at the drums. J. Alphonse Nicholson, directed by Joseph Megel, gives a mesmerizing performance in all the roles. Not only can he change costumes on a dime, he also swoops and swirls in dark, dramatic moments which indicate the passage of time. The effort required in these roles is executed with an exquisite sense of timing. Nicholson rolls humor, pathos, confusion and uplift into a theatrical ball. He persuades us to try on each of the new character roles and then to watch as his leader falters and the devil incarnate takes over. New Federal Theatre in association with Castillo is mounting this show through November 19th. Don't miss this brilliant performance in a provocative, moving and often funny play.